The Windows Vista installer is about 3.5 GB so instead of downloading this huge file, you can get a Windows Vista DVD shipped to your address in India for free. 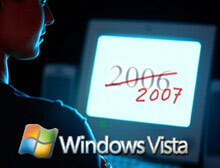 Just register at MeraWindows.com and you will receive 3 Windows Vista Beta 2 DVDs - one for you and the other two for your friends or relatives. MeraWindows.com is a Microsoft Windows Community site for Indian users, not affiliated with Microsoft, but they have worked an agreement with the Windows team in Microsoft India to arrange for Vista Beta 2 DVDs for you. One important step that you miss - Once your register at Mera Windows, just click the manage profile link and type in your postal address where the DVDs have to be shipped.